Yves here. While this post flags a useful data point, it also repeats a widely-believe economic myth, that of the “dependency ratio” being a Serious Problem so that old people or young people or both can’t have nice things. Now we do have other reasons that that will probably prove to be true, namely, resource constraints. But let’s put that aside. There is tons of labor slack in advanced economies. Lots of people are willing to work, indeed need to work and can’t find jobs, or do have work yet are underemployed. Many older people who didn’t wreck their bodies during their prime years would also like to work in what what would normally be considered to be their retirement years, both to have a higher living standard and to get out of the house. Dean Baker has pointed out that “fixing” Social Security, even using conservative assumptions, would require increasing the expenditure as a percent of GDP from 4% to 5%. The US did just fine going from the initial commitment of 1% of GDP to 4%. We have no trouble finding money for the next bombing run in Iraq. We can but don’t choose to prioritize social spending. The largest generation in U.S. history has to start pulling its retirement money this year, kicking off a mandatory movement of cash that could total hundreds of billions in the coming decades. U.S. law requires anyone age 70 ½ or older to begin annual withdrawals from their tax-sheltered retirement accounts and pay taxes on those distributions. The oldest of the nation’s 75 million baby boomers cross that threshold for the first time this month, according to a U.S. Census Bureau estimate of when that demographic group began. The obligatory outflows from 401(k)s and IRAs are expected to ripple through the U.S. economy, the stock market and a money-management industry that relies heavily on fees from boomers’ tax-sheltered savings plans and assets. Jack Weaver, a retired biopharmaceutical product developer, turned 70 in late 2015 and had to pay taxes on his first required payout of $31,000 last year. “It’s unwanted income,” he said. He reinvested the money, and says his wife plans to do the same when she takes her first distribution this year. Based on the size of his required payout, he looks to have over a million Aussie dollars in his own name. I’m also guessing he has been making contributions for his wife or she has been working and so she might have a similar amount in her name. Plus the family home. Plus any other assets that they have outside of retirement savings. This entry was posted in Dubious statistics, Economic fundamentals, Investment management, Investment outlook, Macroeconomic policy on January 18, 2017 by Yves Smith. Can someone please explain the fact that so few explanations of SS problems, and ‘fixes’ mention the $Trillions ‘borrowed’ from SS by congress, and spent on tax-cuts for the wealthy, war, and other general government programs? It would seem to me that every mention of ‘fixing’ SS should start with a demand that money ‘borrowed’ must be repaid. Why is that not so? IMHO, all discussions of ‘fixing’ SS should start after a suitable settlement/plan for repayment of the loans taken from SS. W. Bush telegraphed the Republicans plan: the surplus does not exist. Unfortunately, Obama was less than forceful in defending SS in his agreeing that changes (reductions in benefits) needed to be made. With Obama out of the way perhaps more Democrats will step up and explain that the Republican’s Social Security “crisis” is being manufactured by their unwillingness to honor the United States debt to all of those citizens who paid into and created the surplus. Republicans want the United States to selectively default on its debt, that part of the debt we were told was a savings account for the nation’s retirees. In effect the Republicans have categorized money we paid into Social Security as having been nothing more than Federal tax money, money that was spent on tax cuts and wars and no longer exists. Perhaps someone more knowledgeable than I am about the issue will explain this: while I understand that the federal general budget and the social security budget are separate creatures, doesn’t the fact that since that the treasuries owed by the general budget are booked as a government liability on one side of the page while the treasuries held by the social security budget are booked as corresponding assets on the other side of the page essentially mean that they cancel each other out? In other words, is there any real accounting effect to paying off the debt owed to social security since there appears to be no net gain or loss for the government as a whole? Seems to me to be similar to my writing a check to myself–it doesn’t increase or decrease my net worth. If the political agreement were reached that the Fed were subsumed into the Treasury and subject to policy goals of elected elements of the government and that government chose to cancel it’s debts to itself, with fiat it could at no cost. Likewise it could pay for Social Security just as easily as it pays to bail out TBTF banks or innumerable wars of choice. The problem isn’t the tools at hand, its the psychopaths who’ve got hold of them. I’m increasingly of the mind that only physical action in the real world will pry those tools loose and anything effective has been made illegal, putting all risk onto actors who are more concerned with what is right than what is legal, the law having become a tool of the plutocracy. I think the best example is that young people with huge student loans are banned from declaring bankruptcy to escape that debt burden, forcing them to pay into funds for decades – probably plays a large role in financing the baby boomers retirement packages, I’d guess. The problem isn’t the tools at hand, its the psychopaths who’ve got hold of them. This requires quite a bit of qualification. “The problem” isn’t just one of bookkeeping. Bankers, politicians and especially the nations once called the ‘industrial democracies’ are increasingly exchanging wealth created by labor and capital (more precisely by energy and technology embodied in machinery) for nothing but “checkbook money”, i.e. the implicit promise its recipient will ‘some day be able to consume wealth equal in value to what the recipient exchanged for that money. When there is little to no possibility the creator of that money will be able to deliver on that promise, it is fraud – doesn’t matter whether the recipient is a Social Security pensioner or a ‘developing nation’ energy-rich or low-cost labor supplier. The United States formally transitioned from its role as the world’s banker to the leading supplier of the literally ‘hot’ money the world’s 1% have used since then to amass their obscene monetary fortunes, i.e. the debt the rest of us owe the 1% either explicitly or implicitly as the government debt we’ve allowed our politicians to contract in our name. So these are not “innumerable wars of choice” but coldly logical measures by the representatives of the West’s oligarchies, increasingly desperate to preserve the ‘free lunch’ obtained for them by their financiers and bankers – and guarded by a military security complex originally created as a sink for the surpluses created by capitalism’s “creative destruction”. This whole scheme was given birth by the Kissinger / Nixon petrodollar international monetary system. Since then it has expanded to the exploitation of third-world labor. But while the sums involved may be insignificant – as measured by the amount of US and Western debt held by Middle Eastern oil despots vs that held by developing nations, it is the principal (so to speak) of the thing. In plain English, how do you expect a nation to repay its debts, whether to its own people or to those from around the world when you systematically strip that nation of its ability to create real wealth, not banker debt?? Absolutely, Soc Sec’s Trust Fund asset and the Treasury’s corresponding liability net out. The “borrowing” mentioned by Watt4Bob refers to the Trust Fund containing “non-marketable” Treasuries. When Soc Sec redeems these IOUs, new public debt must be issued to fund their redemption. Whereas if Soc Sec’s political trustees actually had a fiduciary duty to beneficiaries [surprise — they don’t], they would have insisted on marketable Treasuries, where the public borrowing already occurred at the time of issuance. BS – they are “non-marketable” because they don’t need to be “marketable”. Firstly, the price/yield is set by current conditions in the traded treasury market. Next, it is illegal to sell them early, they can only be redeemed at maturity directly with the US Treasury. That’s both a cost saving and safety feature in the law. You’re confusing “flow” and “stock”. They use the FICA flow to make the annual general budget spending look smaller. But the resulting net deficit/surplus still get applied to the national account balances like accountants say they should – resulting in a total national debt and sub accounts to whom it is owed – SS Trust Fund being one of the entities. GWB is more devious than he appeared. He apparently saw the James Bond Goldfinger movie finally and realized if they could say the SS liability did not exist, that would make future credit available to neocons worth more. Fiatfinger! And in an alternate universe the Federal Reserve does not count US debt to the social security, military benefits and other trust funds at all in their reporting statistics. Sorry, this is a fundamental misunderstanding of what “borrowing” means. If you have a bank account, it’s your asset, but the bank’s liability (i.e. debt). When you write a check, you’re assigning a portion of the bank’s debt to you to the payee. Dollars are simply checks made out to cash in fixed amounts. The Federal Reserve carries them on its books as a liability. In otherwords, national “debt” *is* the money. Diminish the “debt,” and you diminish the dollars in circulation or in people’s savings accounts. This makes for tough times for debtors. When dollars are scarce, they have a tough time making their payments, but the lenders are willing to foreclose or force asset foreiture if they don’t. See Randall Wray’s account for the history of this misunderstanding. Hint: decreasing national “debt” leads to Great Depression sized holes in the economy…100% of the time! So the “loans” from Social Security are simply bonds (i.e. debts), and the need to repay them with with some kind of sacrificy or tax is a myth. Such bonds are equivalent to a savings account (they pay interest), but aren’t distinct from the debt/money discussed above in any other significant way. The dollars to repay them can come from government any time, in any amount, without tax increases. Meanwhile: the U.S. has a sovereign, fiat currency, and is not constrained in any way from repaying any dollar-denominated obligation. No country with such a system (of dollars, pounds, yet, but *not* euros) is ever fiscally constrained by tax revenues, either. That’s right, taxes may make the money valuable (dollars retire that inevitable liability), but they do *not* (and obviously cannot) provision government programs. Where would people paying taxes get the dollars to do that activity if the government didn’t spend the dollars out into the economy first? That’s how deep is the propaganda…it’s obviously spend, then tax, not “tax and spend” as the popular press puts it. Meanwhile, even thought the taxes do not provision the program, Reagan and Bush 41 increased FICA eightfold having conned the American public into believing such taxes on working people and their employers were necessary. Again, nothing prevents a sovereign fiat currency issuer from spending as many dollars as they want. (and no, it doesn’t cause inflation, necessarily). Witness the $16 – $29 trillion the Fed issued in the wake of Lehman’s bankruptcy to cure the frauds of the financial sector. Notice that this is four to seven times what Social Security would need to remain solvent forever, too. No inflation, either. Firstly, the SS tax (FICA) is a regressive income tax taking roughly 7% (or 15% depending how you look at it/self-employed) on the first 100k or so that you earn (exact number goes up slightly every year). Secondly, the usual federal income tax is progressive and higher earners pay higher marginal rates. As the funds are fungible and co-mingled, it’s all income tax going in and then money going out. There is no loan as such – it’s a fiction. Until recently the FICA was taking in slightly more than its payout. This allowed the more progressive income tax to be lower. The wealthy got a tax break by paying a little more FICA and somewhat less in regular income tax. FICA taking in a bit more than its outlay makes the tax code, in total, less progressive. Now that the SS is paying a little more than it would take in, this should require using normal income tax. But the latter is progressive and the high earners would pay more. In short, the wealthy didn’t complain when they benefit, but they sure howl when they do not. The people running the media aren’t interested in explaining this since they are/align with the powerful. Thanks! that is some interesting stuff. If whomever (Wall Street? economists? the “government”?) is so worried about Boomers having to take the required minimum distribution at age 70.5 from their IRA/403(b)/etc accounts, then how ’bout raising the age for when one has to take those distributions? It certainly is a first world problem, and it seems like a push me/pull you between super mega greedy Wall Street and the government. Wall St doesn’t want the investments to be distributed out (probably not the correct language) from IRA/etc accounts, but the government wants the taxes on it. Cui bono? Some boomers will want to take the distributions anyway because they need the money. Speaking only for myself, I’d prefer to wait ’till an older age, but I shifted most of my IRA accounts in ROTH accounts ages ago. One does have to pay tax on this transaction at the time, but then I’m not forced into required minimum distributions with ROTH accounts. The people who are starting to take RMDs now would have been about 62 in 2008-9 during the financial crisis. That would have been an ideal time for them to have done the Roth conversion as conservative accounts were 25% down and aggressive accounts 50% down, so their taxes would have been less. Instead, it sounds like they waited until it was too late to do conversions since RMDs can’t be converted into a Roth. That is just poor planning on how to navigate the retirement account tax rules. They need to hire better financial planners and accountants. The government doesn’t owe them detailed personalized advice on how to optimize their finances. With all due respect, these people may not be able to afford to use a financial planner at all. Not to mention the fact that many FPs are little more than salesmen. Likewise, accountants. Some people simply can’t afford to use anything more expensive than, say, H&R Block. 1. A trust. consult a trust attorney. There is not much flexibility, but either can reduce disbursements from a 401l or SEPP, and prolong the term of the retirement payments. Disclaimer: My wife does this for a living. Consultation and management both cost money, which on small principal is not a negligible consideration, and there is no guarantee that those who would manage the trust are competent. As I recall, Jimmy Carter got home from Washington to find that whoever had handled his blind trust had run him deep into debt. People who have relatively limited wealth in the first place are unlikely to want to risk that. If they make dumb mistakes with their money, so be it, at least those are their own dumb mistakes and not the result of trusting some incompetent or Madoff type they didn’t know how to evaluate. No offense, but I think most of those who offer facile prescriptions for people with modest retirement savings simply have no conception of how the world looks from that perspective. Most of us never do see very far beyond our own boxes, and that makes it risky to say what others ought to do. But that is the get-out-of-jail-free card the system uses to evade scrutiny. You blaim the victem for not having clairvoience or seven figure incomes. One can alway second guess past decisions. This is why SS is so sucsesful, and why its always under attack. Current expesises are met with current revnues. Crystal balls are not needed here. I’m rather confused on how one can predict they will be working until of after 70 anyway? It’s not entirely up to whether one wants to or not afterall, but health and whether there is a job market that wants one. Seems to indeed require clairvoyance to me. I suppose one can convert to Roth just in case it ends up the case. Other countries solve this problem with more generous retirement systems. ()% of the FP’s get commissions when they churn the account; they also sell insurance. Used car salesmen they are. The whole IRA system should be taken out of the FIRE sector. Then again maybe the boomers are all an overprivledged generation if that’s the rarefied air they all breath. Which if true, no wonder Gen X and millennials can’t relate! The government doesn’t owe them detailed personalized advice on how to optimize their finances. I say that in that case the government should never have created programs that would be above the capacity of most to manage effectively. I have to agree that the pension system is screwed up. So many people with 3 or 4 small accountsif not more instead of 1 big one that can be better managed with lesser fees and more investment choices. People are all over the place, a real headache and then everyone wonders why it’s so expensive to manage. I’m sure a lot of people were taking early distributions (and being penalized with extra taxes) so they could survive the financial downturn. 1. Social Security is probably the most efficient fiscal tool for recirculating money in the economy, especially compared to the policy makers preferences of tax cuts to the wealthy who will just save the money. Social Security recipients will generally spend every penny of their monthly check within 30 days on things like rent, food, heat, transportation etc. This immediately gets put into circulation as stores pay workers and suppliers. SS payments probably have the fastest money velocity of any fiscal moves the government will make. 2. Tax deferred accounts are an artificial government construct. The rules can change at any time. They tend to withhold money from circulation but do provide funds for investment as primarily stocks and bonds are held. in them. However, it is reasonable for government to limit their purpose to what is intended, namely retirement savings. As such, I have always viewed RMDs as a reasonable public policy – some of the implementation at the tail end (over age 90 or so) can probably be tweaked to be less draconian but starting the withdrawals at age 70.5 seems reasonable. 3. Probably 95% of the population will need to be taking out something close to or greater than the RMD at that age anyway. Retirement policy should really be focused on benefiting the bottom 90%, not the upper 10% who are most likely to have adequate resources (which is why they complain about RMDs). Started to get taxes from unneeded tax deferred retirement savings is good societal policy. 4. I think there are two simple Social Security and Medicare funding solutions. Sam Johnson wants to eliminate income tax on Social Security. I would repurpose that tax and call it a Social Security surtax. One of the problems that Social Security and Medicare have had from Day One is that the previous generation that did not pay into the system are beneficiaries, so we are always covering the previous generation’s costs. The current income brackets with escalating Social Security amounts that are taxed is an opportunity to rectify this. The current income tax on Social Security is repurposed to funnel the money back into the trust fund to cover Social Security and Medicare instead of going into the general fund. That means that the wealthier retirees, especially those pulling out unneeded RMDs, would help stabilize Social Security and Medicare within the current generation. Combining this with increasing the income cap for Social Security FICA taxes to match the Medicare tax structure would likely solve the Social Security funding dilemma without benefit cuts or FRA increases. These two solutions would be a mix of getting the current generation to extend the life of the trust fund to cover their own costs while raising the salary ceiling would be the traditional working generation covering retirees component. 5. The estate tax is crucial to America remaining American instead of becoming a European feudal landed aristocracy with serfs. The objective of the estate tax is to prevent families having massive untaxed hereditary wealth across many generations. Keep the current exemption limits to allow for real family businesses like machine shops, farms etc. to pass down unhindered for the next generation to operate but force breakups of large family conglomerates so that future generations really have to earn their way. I think Americans really like first-generation wealth who really created it but despise people who are simply living off of unearned investments from generations past. Multi-generational dynasty trusts should be eliminated, but a one generation trust that is scheduled to be dissolved after one generation has passed on is probably a reasonable compromise. re: SS taxes. The biggest problem here, imo, is that the SS taxation level isn’t indexed. It’s still set to what it was in the mid-1980’s. What looked like a very reasonable allowance then has over time and inflation been functionally reduced to very little. To be clear, I’m referring to the taxation on SS benefits paid, not the FICA tax. Taxes do not provision government. No Social Security tax is required. That’s right, sovereign currency creators (dollar, pound, yen, but *not* euro) do not require taxes to fund their programs. My previous comment describes how currency *is* the National “debt” (not at all like household debt because the nation issues dollars and can do so without limit). Why have taxes at all? To make the money valuable. The Brits came to Nigeria wanting to employ people, offering nice, British money to hire Nigerians. The Nigerians weren’t interested. Then the Brits imposed a “hut tax,” an inevitable liability that only British money could retire. Immediately British money was in demand. Taxes obviously cannot provision government, too. Where would tax payers get their dollars (with which they pay their taxes) if government didn’t spend them out into the economy first? Austerity is a whip in the hands of the plutocracy. You had better take whatever crappy job is on offer, or you’ll suffer the indignities of poverty, and possibly even starvation and homelessness. Transforming a population into debt peons does a similar job of creating a compliant population. It might help to educate people if those explaining Modern Monetary Theory (which is NOT a theory, but an accurate description of how fiat money works) would also point out that although the federal government is not budget restrained, everyone, and every institution on this planet ultimately is resource restrained, as I believe Yves alluded to in her introduction above. $16-29 trillion? Not disagreeing just curious if you have a link to that figure? I always thought one potent political strategy for the Left is to clearly and repeatedly state in simple dollar terms what has been stolen from us and to demand repayment. Something similar to those annoying debt counters you see all over the web by fiscal scolding Austrian Astro-Turf Gold Buggers. The Fed (via warped monetary policy) and Wall Street OWE US! Time to pay up! Agree completely. Unlike what people are led to believe, this generation’s SS taxes don’t pay for past generation’s benefits. Another myth! I am much obliged to you for your two posts Adam Eran. I’ll just keeping reading them and saying them out loud and eventually its going to sink in after a lifetime of believing something else. Thanks for lifting the veil. For completeness please add an explanation while the Euro and ECB cannot do like the others, thanks. I disagree strongly with #5. Americans tend to spend, give the charity, and so on to dissipate family fortunes quite without the need of the estate tax. To develop real estate beautifully, you need a hundred year horizon. Might be better here to just not tax improvements on real estate, which are a big reason we can’t have nice things. If he doesn’t want the money, what is he living on? There are some missing details here. I am one of those folks who has retired and is drawing on retirement funds, following the rule of taking down the more heavily taxed parts first, that being the 403B, leaving the stuff with capital gains next, and the Roth and stuff on which tax has already been paid (active trading does this) for last. The interesting part of the calculation: How do you calculate the withdrawals so that your after – tax income stays level, up to changes in the market? I did find the solution. That’s the point… he has too much money. Probably from another pension or annuity. Unneeded money? Ha! Send it to me. Mr. Weaver should just be happy the government hasn’t seized his entire IRA yet. We all know that’s surely what’s coming. Retirement accounts are a too big pool of money to be left unmolested by the politicians. They’ll start with means-testing and end with wholesale seizure. Because inequality. Fiddlesticks! If the whingeing Mr. Weaver doesn’t want the income he could give more of it away. Complaining about having too much, as if that were a government-imposed hardship, is about as silly as it is contemptible. 1. It’s not the dependency ratio, it’s the productivity increases that matter. 2. Yes, people invested in the stock market and other instruments to save for retirement. Now that they’re retiring they are drawing on those savings. 4. SS. sigh…..People retiring now started paying larger percentages of their income to the FICA payroll tax compared to earlier gen in the mid-1980’s in order to build up a trust fund for their future need. At the same time Reagan cut taxes for the Peterson-level income folks and justified it by using the increasing value of the trust fund as an offset. Misuse of accounting, imo. The trust funds ‘loaned’ to the govt to cover the cost of the tax cuts was supposed to be paid back by raising taxes later on the Peterson-level folks who got the tax cuts. Those folks are loath to see their taxes increase, understandably. However, if there’s a money drain, it comes from those tax cuts, not from the current generation retiring. Any suggestion to cut SS or Medicare for the generation now retiring would be a double-taxation on them: first the increased % of SS taxes though out their working lifetime, and from here forward benefit reduction in order to offset the tax cuts the very rich got starting in the mid-80’s. And yes, the Dems (Hello, Tip O’Neill) were very much a part of that bait-and-switch tax scam. Sure, in a larger sense, an affluent economy like the US can afford to fund Social Security, or wars, or infrastructure, or whatever it decides is a priority. But given decades of political logjam in which Social Security’s fiercest defenders refuse to countenance any changes, Soc Sec’s dedicated funding is STRONGLY affected by the dependency ratio. That’s why it’s discussed every year in the trustees report. Even if (as a hypothetical) Social Security’s payroll tax funding were changed to general budget funding, the dependency ratio would still have an important, though attenuated, effect. Only in an economy where every retiree has accumulated an adequate, fully funded pension during their working career, would the dependency ratio become irrelevant. The US and its rich country peers are far from reaching full pension funding. Soc Sec is the worst offender, being only about 20% funded, and headed for zero in 2034. Thus, the dependency ratio remains highly pertinent. Excessive dependency ratios are a major reason why the developing world is trouncing rich countries in growth, and likely will continue to do so. Rich country social benefit programs were designed with front-loaded benefits, back-loaded costs, and the assumption of endless labor force growth. The “endless growth” Ponzi element is now eating their lunch. What are we to do with the math-rejecting Ponzi denialists? HA! Let’s just say anyone with half a brain knows that if the other gang is allowed to open Pandora’s box – they’ll shove in every worst specter imagineable by humankind. There’s been no log jam, just a transfer of power from its formal institutional location into private or secret hands, MIC/FIRE being the private and the Surveillance State being the secret. Demonstrably these institutions have gotten damn near everything they want in the last two generations. The distributional effects of NeoLiberalism have created the illusion of “front-loaded benefits, back-loaded costs” by stripping income out of the real economy and depriving investors of “demand” signals to justify real investments there rather than feeding”investment” into the FIRE Ponzi. 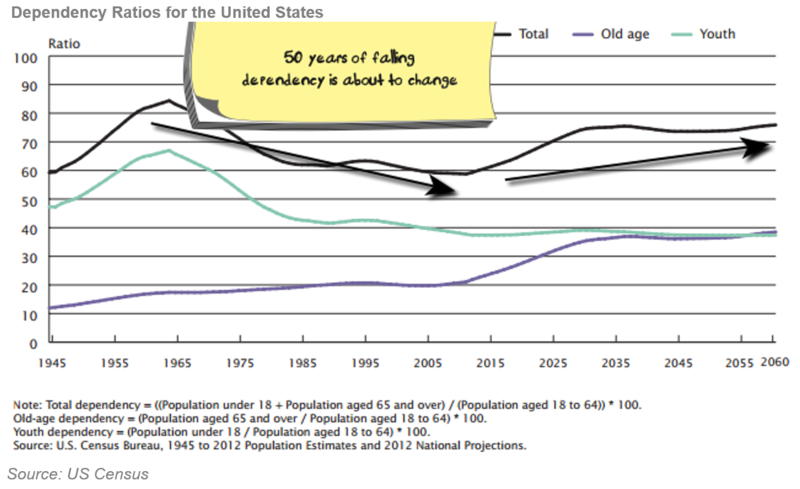 The dependency ratio is very important because of the baby boom followed by the baby bust. Plus the fact that the baby boom has adopted a more costly lifestyle, more resource intensive, than that of their parents. The other issue is that for many people the idea of working at a tennis club, golf course, teacher, etc. is more attractive than working in geriatrics. Well their parents kind of adopted a resource intensive lifestyle by having so many kids in the first place. THAT is resource intensive. While I’m sure that there are a number of 70.5 year old high net worth individuals, I think that most people of that age don’t have large balances in 401ks. I would suspect that most of the savings of that cohort are in the form of defined benefit pensions. While I’m someone who’s currently under the “onus” of having to accept a RMD, [that’s snark, in case you can’t tell], the crisis I see coming is that too few “future retirees” look at what their RMD would be from whatever IRA $$$ they’ve been able to accumulate, and instead look at their total investment. With all the noise these days about how few folks have $10K or $20K socked away for retirement, I was explaining to my millennial son how even a fabulous $100K IRA would require only a $4000 RMD. Yes, one can withdraw more than that, but the funds will last for a shorter period. Current retirees are more likely than future ones to have a pension. That may mask how screwed folks are and will be as they try to exist on always-under-attack Social Security and those RMDs. I’ve seen a few recent articles about the creators of IRAs realizing that they weren’t such a great idea, particularly since they were transformed into an excuse to obliterate company-provided pensions, but I’m not seeing much on how truly bad things are going to get. Perhaps TPTB expect us all to move to Waco or Boise. On some of the “fixer upper” shows, I see that one can buy a comfortable house for $200K. Yup. Even the WSJ is catching on. That’s one of the articles I was talking about. A few years/decades too late. Another factor in the dependency ratio is that there are far fewer children now, so the ratio remains similar. For just one example, I was one of 5; that was the NORM on our (rather prosperous) block. That is now quite rare – they have to be inordinately religious. With a declining population, which is what we should have (resource constraints), it becomes important for older people to work if they can, and things like SS should reward that – even though its original purpose was to encourage retirement and open up jobs for young people. That assumes we’re actually putting our labor force to good purpose, of course. Unemployment equals wasted capital, since to a great extent they substitute for each other – that’s what “productivity” means. I find it extremely funny that someone with mandatory withdrawal of $31k is complaining. There are millions of retirees who wish that they had that much in mandatory withdrawal available. I guess that when you are wealthy person any tax is a burden (why should US government get any). Yes, Yves is so correct in saying that there are plenty of retirees that wish that was some job available for them. You can count me in that group. I was pushed out of workforce back in 2009. I hope you’re doing okay. I have a friend who got pushed out last year, just a couple of years after an award for forty years’ service: first stunned, then livid, then talking about resume, then doing other things–and I think quite happy to be, but…. “any tax is a burden” to those poor souls. What they tend to forget is that they did not pay income taxes at the time they received the income. The idea behind the ira was to defer income taxes to when your income would likely be lower, so the whiner is likely not paying as much taxes on his withdrawal compared to the rates in effect at the time he earned the income. How quickly and conveniently they forget! Well, I’m just glad to see us baby boomers back in the headlines. Use to be we were there everyday, twice on Sundays even. But then the Gen-X and Milli’s took over and people forgot us. BUT we didn’t forget us. Now we’ll take our money and go away! Won’t you all be sad!! Ha ha. Er, what’s that, Mr Giesner? You used our money to foam a runway? What??? Owners will get to where labor is hardly needed any more. Privatization will set the stage for wholesale theft, and robotics plus drone warfare combined with abrupt climate disruption will get rid of most of the population, then they can proceed unimpeded to colonize Mars. Sound ridiculous? anybody mention the really low interest rates? The dependency ratio is increasing. Automation and robots are about to replace a lot of jobs. The problem is going to be how we distribute income. Conservatives, libertarians, Republicans, and neoliberals are worse than useless on this issue. This idea of how the Fed creates money needs to become so ingrained that when any politician talks about needing to raise taxes or cut spending elsewhere to pay for some government program, the audience instantaneously boos them off the stage.